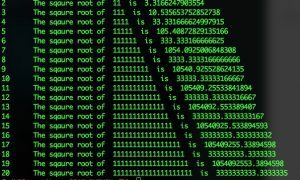 My daughter and I were recently playing with python’s square root function. She discovered that if you evaluate an even number of ones, the square root is half that number of three’s on both sides of the decimal. 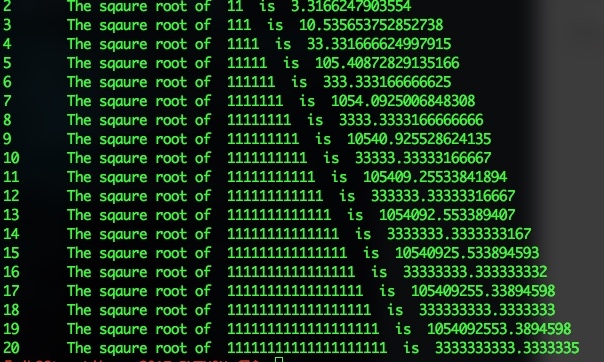 So √11 is approximately 3.3, and the √1111 is approximately 33.33, and so forth. We learned that this continues until there are eight three’s on either side of the decimal point, then they reduce in frequency. The square root of an odd number of ones is also patterned. √1 is 1, √111 is 10.5, √11111 is 105.4, √1111111 is 1054.0, and so forth. Although it looks like the sixes also multiply, they also reduce after reaching eight in a row. Check it out with python’s decimal package. from decimal import Decimal, then in the print statement, add Decimal(math.sqrt(answer)).